The mildest of the bitter greens, mustard greens are especially good and colorful when cooked with cream. Serve Creamy Mustard Greens as a side dish with Glazed Pork Chops, or any meat dish that could use a little extra color. Mustard greens are leaves of the mustard plant. And you know how mustard tastes, right? Well, the greens also have that spicy flavor. Buy greens with deep green leaves (no yellowing) and thin stems. Blanch mustard greens in a large pot of boiling water for 5 minutes. Plunge greens into ice water to stop the cooking and to retain flavor. Drain greens, spin dry, and set them aside. Sauté onion in butter and oil in a large sauté pan over medium-high heat for 5 minutes. Add cream; bring to a simmer. Reduce cream until it's thickened, about 5 minutes. 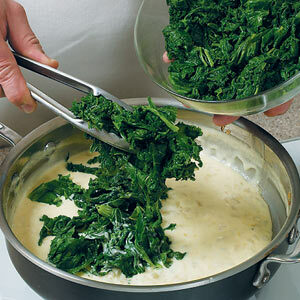 Add greens, stirring to coat with cream mixture; cook 2–3 minutes. Season greens with salt and pepper. After boiling greens, use a slotted spoon to transfer them quickly to a bowl of ice water. Plunge greens in cold water for 1 minute to stop the cooking. Reduce cream mixture until it's thick enough to leave a trail when you draw a spoon across the bottom of the pan.